While falling stock prices have provided a beat down to the values of Americans’ 401ks in the fourth quarter of 2018, falling prices at the pump have added a little bit of a cushion to their wallets. Through yesterday, the national average price of a gallon of gas was just under $2.30, which is down from just under $3 a gallon back around Memorial Day weekend. That’s the lowest national average price since the Summer of 2017. 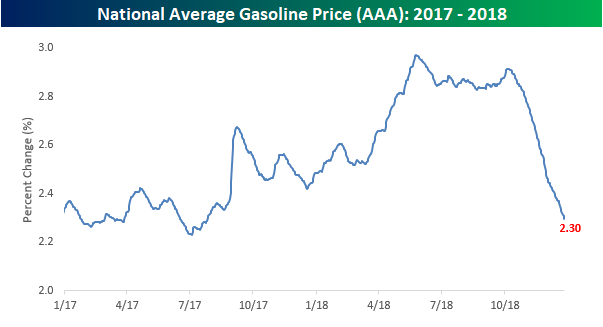 With the recent decline, gas prices are poised to decline over 7% for the year, which would make this just the fourth year since 2005 that prices were down. The other three years were 2008 (-46.4%), 2014 (-30.9%), and 2015 (-10.8%). Compared to the average annual increase of over 5%, consumers got off easy this year! 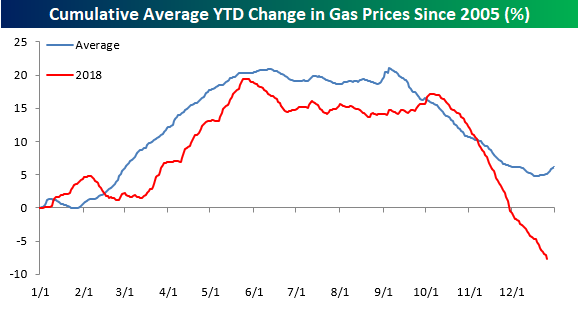 While gas prices have been considerably weaker than normal in 2018, the weakness was primarily a fourth-quarter story. 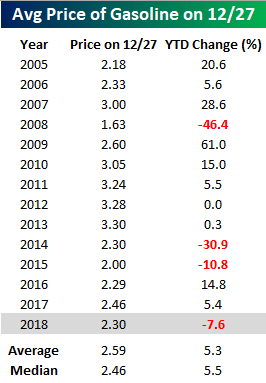 The chart below compares average prices this year to a composite of all prior years since 2005. Right up until the start of October, prices were tracking their average very closely, and while the late year weakness came right on cue this year, its intensity was much stronger than normal as crude oil prices plummeted. While market watchers figured stock market weakness would crimp holiday sales, the positive impact of gas prices seems to have more than counteracted that negative pull.